No 24: Max stops Linda, asking her what she thinks she's doing. Shane comes in and tries to stop his dad, who can't believe she's using his phone to make hotel reservations. Shane points out that this is his new boss, Mrs Fielding, and Max backs off a little and allows her to finish the call. 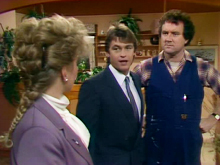 Shane drags Max into the kitchen, and he calms down a little when he hears that it's just a business trip to Canberra, and Mrs Fielding needs him to drive her around. 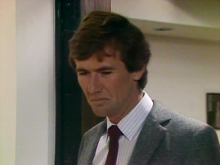 Shane rushes off to finish his packing, while Max goes to apologise to Linda, telling her that Shane is honest and hard-working, and he was almost a champion diver. Shane then returns and they leave, with Max watching from the window. 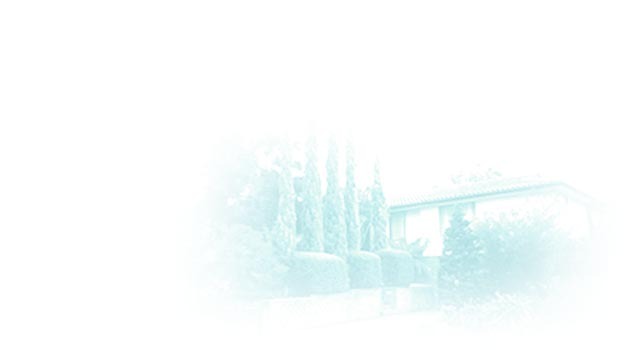 Ramsay Street - No 24 Driveway: Shane sees Linda to the car, and then drives them out of the street. She starts talking about his dad, and his claims that Shane could have been an Olympic champion. Shane admits that he won some trophies, but there were no guarantees of making it to the Olympics. She asks what happened, and he explains about the car accident, but she suddenly snaps at him that she's heard enough and she doesn't want his life story. He looks surprised. No 24: Max is having no luck on the phone, trying to find a new assistant. Maria then comes in with the shopping, and he tells her about meeting Shane's new boss - a woman. When Max mentions the name Linda Fielding, Maria remembers reading something about her and her husband, but says she's just glad that Shane's working. Max, however, doesn't think it's right that a woman should be in charge. Maria doesn't understand his attitude, and again mentions that she's thinking about getting a job, as Max can't support her forever, especially if he wanted to remarry one day. Max says that he isn't the type to remarry - but he thinks Maria is. She reminds him that he walked out on her - and he says that any man would have done the same if he'd found out that his wife was promiscuous and a liar. She just looks at him, and he leaves. Pacific Bank - Office: Julie knocks on Philip's door, and presents him with some figures he asked for. He's very grateful that she got them to him so quickly, and admits that he's in quite a muddle with everything. Julie tells him that everyone thinks he's doing a very good job, and he's happy to hear it. He talks to Julie about how long she's been at the bank, and asks whether she has a boyfriend - surprised to hear that she doesn't. She talks to him about whether he's found somewhere to live, and whether he's missing his family, but he's quite distracted. As she leaves, Philip asks Julie about her car, and she explains that it's still being serviced, so he offers her a lift home. No 26 - Lounge: Jim arrives home, telling Paul that he's taken the day off. Paul also has a late start. They talk about Gloria and Paul admits that he misses her now she's moved away. He thinks that Gloria and her mum will be fine - Jim again admits that he's proud of Paul for the way he dealt with that situation, but tells him not to let it go to his head. No 24: Terry knocks on the door, and Maria thanks her for coming - saying that she wants to apologise for what Max did - and asks her inside for coffee. Maria talks about how small-minded it was of Max to sack her, just because she couldn't do that job, but Terry quickly changes the subject, asking where Shane is. Maria explains that he's gone away to Canberra with Linda Fielding - his new boss. Terry is surprised to learn that Shane is working for a woman, but Maria assures her that it's just a business relationship. Maria believes that Terry should continue trying with Shane, and Terry decides to write him a note. No 26 - Kitchen/Lounge: As Jim peels some potatoes, Lucy comes in wearing one of Helen's dresses. She explains that she's borrowing it for a dress-up day at school. Jim thinks she looks wonderful, but Lucy says that it's too old-fashioned, but Julie won't let her borrow one of her dresses. Lucy wanders into the lounge, where Scott tells her she looks stupid - and she agrees with him. She asks Scott if he'll ask Julie to lend her a dress, but Scott doesn't think Julie will listen to him. Lucy declares that it's all unfair, and storms off out of the room. 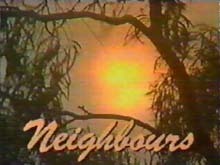 Ramsay Street: Philip pulls up outside number 26, to drop Julie home. They talk about the stresses of travelling on public transport, then Julie asks him inside for a drink. He says that he'd like to, but he has a lot of work to do - the bank keeps 'old buzzards' like him very busy. Julie smiles, realising that he's not going to let her forget that comment. She thanks him for the lift and gets out, watching him drive away before she goes into the house. No 26 - Lounge/Kitchen: Lucy watches from the front window, telling Scott that Julie is kissing a man. Scott doesn't believe her, but Lucy keeps on saying it, until Scott gets up to have a look and realises she's lying. She says that Julie really did come home with a man though. Julie then walks in, and Lucy teases her about her new boyfriend. Julie says that she won't talk to Lucy when she's being silly, and goes off into the kitchen, where she greets Jim. She offers to cook the dinner, and Jim happily lets her. He asks about the new bank manager, and she says that he seems fine, but she's not had much to do with him. Jim reminds her that she went out for a drink with him, but she says that was just a friendly gesture. No 24 - Kitchen: Maria is clearing up the breakfast things, when Shane walks in. He says that Mrs Fielding is a real slavedriver, and all she thinks about is work. Maria asks about her husband, and Shane admits that he hasn't met him - and Linda hasn't spoken about him. Maria is glad that Shane doesn't seem to be falling for his new boss - and says that Terry will be pleased too. Shane isn't so sure, as he was quite rude to Terry the other night, but Maria tells him that Terry was there yesterday and she left a note. She gives the note to Shane and he opens it. No 26 - Kitchen/Lounge: Julie is in a very good mood, singing to herself and offering to make everyone breakfast, and the rest of the family is slightly confused. Paul asks Julie to sew a button on his shirt, and she happily agrees. Scott wonders if Julie has caught some kind of disease - and Jim hopes that there's no cure. Lucy still thinks that Julie won't lend her a dress - Jim sends her off to ask, with Scott making a $2 bet that Julie won't do it. Lucy goes into the lounge and asks - Julie happily agrees and sends Lucy off to find a dress in her wardrobe. Paul looks very confused, and Jim tells Scott that he'll deduct the $2 from his pocket money! Smugglers Pub: Terry thanks Shane for lunch, and he thanks her for the note. He admits that he thought about her a lot when he was in Canberra. She tells him that he needs to know the full story about her and Gordon Miller - although she left him, she thinks that he might still want her back - he went crazy and threatened to kill her when she left. She says that she only felt safe to come back to the city when Gordon was put in prison after the bank robbery - but now she's been getting threatening phone calls. Shane suggests that she leave her flat, and thinks that she might be able to move into Des's spare room. Terry is grateful, but Shane admits that he'll like having her living almost next-door. He offers her a lift home in the limo. Limo: Shane is driving Terry home, and she's very impressed with the limo, when an announcement comes over the radio that Gordon Miller has just escaped from the police van taking him to prison. Terry looks shocked.